What are the functions, food sources and serving sizes of different food groups? Understanding how different food groups serve different purposes in meeting our nutritional needs and maintaining our health would explain why you have to vary your food choices among them every day. 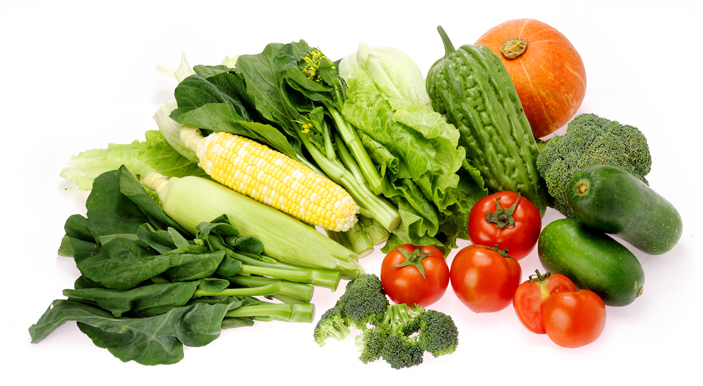 Different types of vegetables offer a wide variety of vitamins and minerals. For examples, vitamin A, vitamin C, folic acid, iron, calcium, zinc, magnesium and potassium etc. They also provide plenty of dietary fibre. The vitamins, minerals and other nutrients in vegetables work together to strengthen our immune system and protect us from chronic diseases such as diabetes, hypertension and cardiovascular diseases. Fibre can improve intestinal function and prevent constipation. Fresh, canned or frozen vegetables. Beans, peas, mushrooms, seaweeds and sprouts. Fresh vegetable juices without added sugar. Eat a variety of vegetables with different colours to get different nutrients. Choose fresh vegetables whenever possible. Eat plenty of green leafy vegetables and orange or yellowish vegetables which are rich in vitamin A and C. For example: Chinese flowering cabbage, carrot, tomato, etc. Do not overcook vegetables or the nutrients may be damaged or lost. Most vegetables are naturally low in fat but they are sometimes added with extra oils and should be consumed only in moderation. For example: salad with dressing, corn with butter and deep-fried vegetables. Avoid preserved vegetables, such as salt-cured and pickled vegetables. This entry was posted in Beauty Advice. Bookmark the permalink.